Perhaps it was because it was my father's generation, but I recall yearly headlines, parades and a sense of international unity which built around June 6, 1944...more famously, or at least in those days...famously known as D-Day. Today, not only is that day gone...but it is almost forgotten. 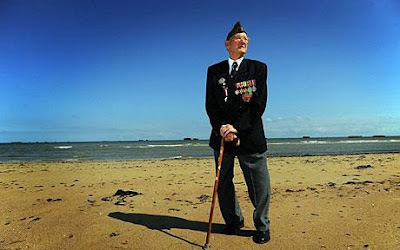 But in 1944 it was nothing short of a miracle, as Sir Dayvd's Island graciously lent its hallowed shores as a staging ground for the liberation of Europe from Hitler's iron grip. I had four family members who participated on that fateful day. My father was a crew member of one of the landing ships, who saw many such ships exploded by mines, German 88's and racked with machine gun fire, but miraculously made it through several trips unscathed. My uncle Oran, his oldest brother, was flying support with the 8th Airforce that day, again without a scratch. My uncle Ray, married to one of my father's sisters, was one of a handful of Army Rangers who landed at Omaha Beach, scaled the cliffs and took out the 88's on top that where causing so much havoc, and made it out alive. He did take a bullet...his third in as many campaigns going back to North Africa. My uncle John, my mother's brother and father to Sir John of the Rangeline, jumped with the 82nd Airborne behind enemy lines that day. He made it unscathed all the way to Bastogne, where a German Tiger Tank blew up the headquarters where he was a quartermaster and a large ceiling beam crushed his back. But fate was on his side...because after Patton rescued them in the Battle of the Bulge, he was shipped back to London where he met his nurse, soon to be his wife and my aunt, Nita. That is just one family of many families who made a difference on one day. Days like this often cause me to think of the many D-Days we all face. D-Day is not necessarily a negative, violent, glorious or momentous day...but a day where the fates shape around you to launch you towards another chapter in your life...usually unexpectedly. Mine can be summed up with the death of my mother at 17, changing majors in college from music to communications, getting fired from my first job after college for taking a risk...which lead me to my present career (if that hadn't of happened I might still be running camera at a television station waiting for retirement...this is also where I met Sir Bowie), meeting Lady Allwinky on a elevator on holiday in Jamaica, the birth of my children, losing my dream home because of a business calamity, my open heart surgery, breaking my back, meeting Sir Dayvd at McGrath's in Harrisburg, leaving a company and partnership I built after 25 years, starting a new business, launching the Knights of Moleskine, Spirit and Ale. What are your D-Days? Always remember and respect them. They make us who we are as individuals and as a collective. There are precious few veterans of that day in June of 44, but they still remember what they did in spite of their fear. You can never get rid of fear, but you can put fear in its proper place and continue to move forward. Every one of my D-Days starting in fear, but propelled me to an even greater appreciation for life and for what is possible if I only believe in myself more than in my fear. Make this day and every day the best D-Day you possibly can! ..as my father is fond of saying...especially as he was being fired at in the dark. as aircrew gunner.. over the DZ..that dawn... "when a nation is actively trying to invade your homeland or to kill your wife and family, it brings out the killer in you no matter what your religion says... we were so into it nobodys life mattered anymore. On that Iconic Photo... they had an interview with that GI last night.He was the only one to make it out of the landing craft...as a shell came over just after the pic was taken and blew it all up with the troopers on..
Thats as far up the beach he got..as he took four shells in the shoulder and one in his leg, and that was that. I think Spielbergs take on it is one of the finest 22minute memorials to those guys ever filmed. 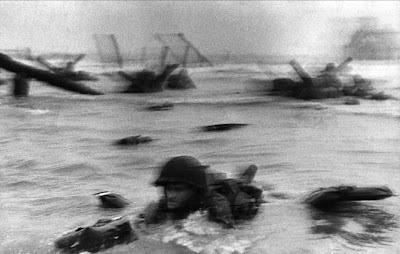 Tho i do take my hat off to Capra who took that photo on Omaha beach.... he was sat there in that hail of gunfire with just a camera... he shot 37 rolls of film during that fateful landing... and when he got back to the darkroom an accidental fire destroyed all but 8 of the frames of which that one went world wide. I wonder how pissed he was after the fire was out.